Hello, foodie friends! This week I’m featuring a recipe from Unleashed, the third book in my Gemini Men Series. Readers might remember that my hero, Danny Taggart, had a fondness for cooking. You may also remember that he occasionally struggled with… how shall I put it… anger issues. Some of which he worked out in the kitchen. Hence, the idea for “Danny’s Angry Steak” was born. 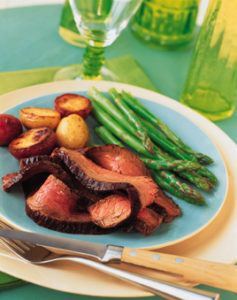 Here the chipotle marinade gives a smoky, spicy kick to the delicious flank steak. Enjoy it with a glass of full bodied red like Syrah or Zinfandel.